[prMac.com] Santaquin, Utah - Faber Acoustical today introduced version 2 of its flagship product, Electroacoustics Toolbox. 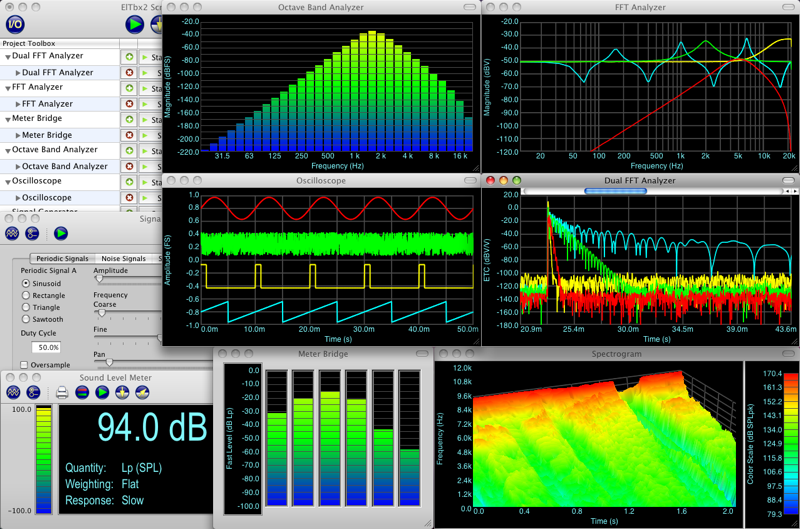 Electroacoustics Toolbox brings powerful tools to the Mac for multi-channel, audio-band data acquisition and real-time analysis of electrical and acoustical signals and systems. "Electroacoustics Toolbox offers amazing flexibility to audio professionals, acoustical consultants, students, educators, and researchers," said Ben Faber, owner and president of Faber Acoustical. "There really isn't anything like it in the same price range." The Toolbox's enhanced interface provides more efficient on and offscreen drawing, improved signal selection, and new mouse cursors for more intuitive interaction with 2D and 3D data plots. Several of the analysis tools have been significantly enhanced, as well. The new Sound Level Meter makes it much easier to calibrate a measurement microphone and the Meter Bridge behaves much more like a multi-channel version of the Sound Level Meter. Also new is support for Audio Unit generator and effects processor plug-ins within the Signal Generator tool. Electroacoustics Toolbox 2 costs $499 (USD). Licensed users of previous versions of Electroacoustics Toolbox can upgrade to version 2 for $199. Upgrades are also available from version 2 of SignalScope and SignalScope Pro for $420 and $250, respectively. Special education pricing is available. Electroacoustics Toolbox requires a PowerPC or Intel-based Mac running OS X, version 10.4 or 10.5. More information on Electroacoustics Toolbox can be found online at Faber Acoustical.